To make sure you don't miss the chance for the introductory discount, please enter your name and email address in the boxes below and click "Keep me posted"
Just to tell you how much you influenced my work: a year ago I started the project to make an album all by myself. In April I had 3 tracks finished and went to Abbey Road to master them. Once home I found your book on multi-band dynamic processing and started following your blog and tweets. The idea was to have a full album by now but ... I need to go over all the previous tracks. Now it is going to take me a while before I am ready for mastering (guess who I want to master it .... Now you wait :)) You changed the way I enjoy and do music, for the best I believe, but now I am 2 months behind my schedule! Thank god it is not my job, just an expensive hobby :) Thanks for the help and the great advices. There's a new Masterclass video and interview to download every week, covering more and more advanced mastering techniques. 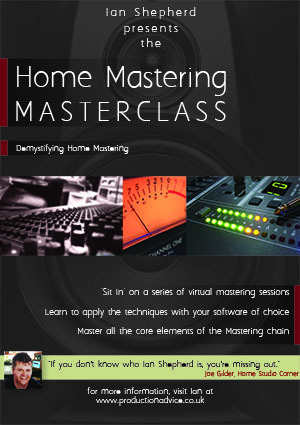 Finally you'll get the concluding "Home Mastering Overview" video, which pulls everything together and adds more detail to some topics. One concern I had was I did think it was a bit pricey...... just being honest..... it's actually why I didn't grab it right away, and then I figured, what the heck, go for it, and I am happy I bought it. I really enjoyed it and here's why. It was simple, easy to understand and made sense to someone like me. A lot of stuff out there is way too detailed and confusing, you just got right to the point and made sense..... that's a skill my friend. I find when I read some stuff, I learn a lot but am left more confused than when I started.... I have more questions about what I learned than answers, ya know..... but not after your book..... and the video was a great way to see it in action. The learning curve is huge!!!! But I think I'm getting somewhere lately, and you have really helped. Type your name and email address in the boxes and click "Keep me posted"